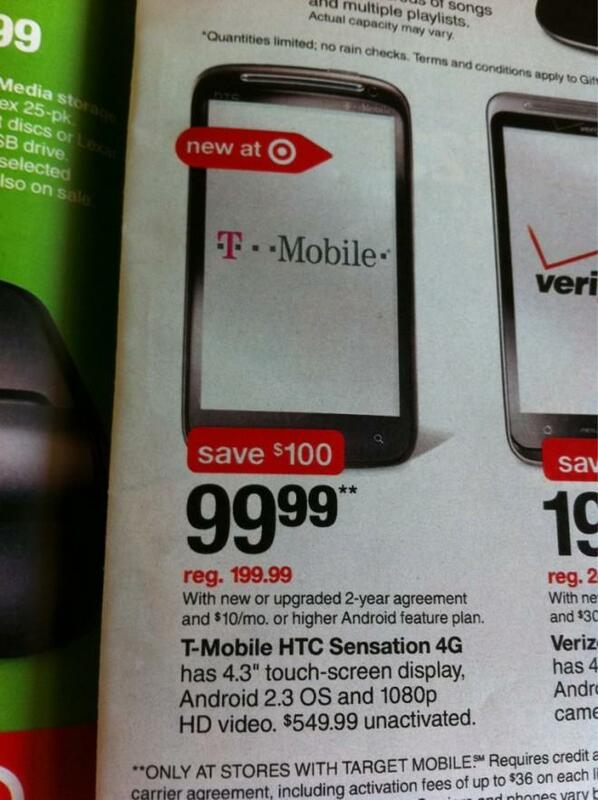 For those of you looking for a great deal on the HTC Sensation 4G and can’t catch a break when T-Mobile posts their midnight sales Target has a deal for you. For just $99.99 you can pick up the HTC Sensation 4G and join T-Mobile or upgrade your existing line for a $100 savings. This deal is only good at stores with a Target Mobile kiosk so make sure to look up your local Target and then head on over to take advantage of this great deal! It’s available online at Target and online at Radioshack. In the same boat. Pulled the trigger Thursday. Could probably jump through hoops to try and recoup that $99, but I’m too busy playing. Sweet phone. Hi David I plan to get this for upgrade (I’m due since Feb) now my Q is can I get the new value plan for this? Do I have to pay other extra fees? Thanks pls. reply. if you upgrade and take advantage of this really great price, then you can not switch to the value plans w/o paying a $200 migration fee. There are no phone discounts on the value plans. Sounds like he would be way ahead. Wouldn’t he have to pay full price for the phone, otherwise, with the value plan? Like $600 or so for the phone? any one did the MAIL IN REBATE for the HTC SENSATION with tmobile? Nope, just the rebate form and and a copy of the receipt (assuming you bought it from a T-Mobile corporate store). No, if you purchased you phone through Customer Care you just need to fill out the rebate form and mail it. Of course you would know this if you had read the rebate form. Is the bootloader unlocked yet? Can I do the upgrade at that price, even if my contract started just 7 months ago? no. you would have to be eligible for “full discount” pricing. meaning 22 months since last phone purchase. with your contract only 7 months old you have not earned an upgrade discount. Can Someone Tell If Theres A Difference Between Buying A Phone At A Target Kiosk Rather Than Buying It At A T-Mobile Authorized Dealer??? It’s available until July 30th with Radioshack, not sure how long it will last with Target. Going to my local Target after work. Have to look into this for sure. $100 for a highend device? Not too bad. None of my local Target stores carry T-Mobile! I wonder is valid online too? Not available online. In stores only. This is available online, despite it saying Target Kiosk. It’s also available at Radioshack until July 30th. Where on Target do you see it? I see it on Radioshack but don’t see it anywhere on Targets site. Also on Radioshack’s site it should be pointed out that it won’t let you upgrade at that price only for new customers. When you say you are ugrading/renewing the price jumps to $250. Target’s ad says new or upgrade. My apologies but it is no longer available for 99.99 on Radioshack for upgrade customers only for new customers. It is on target.com. Go to targetmobilestore.com and it’s there for 99 for new customers and customers eligible for the upgrade. damn man call a target store any store anywhere and place the order on the damn phone. This sale is also available through Target’s mobile website. If you are upgrade eligible, you have to be willing to change your phone plan to get this pricing. can i add on a line to my family plan to take advantage of this or do i have to open up a new account? why not contact the store and ask them directly………what is wrong with you. Cant you dial a phone number and speak? Has anybody found any Target stores in the suburban chicago area with this phone in stock? You can get this deal online at Target and Radioshack. Thanks for the link. Will still try the store first, since I’m 6 miles from one. I mean why should I wait for the phone when I can pick it up tonight. No problem. You might want to call ahead before making that trip. This deal is available online as well, not just at Target Kiosk. I will buy one when Dave does. All the drones buying up the hardware that will be doorstops soon. So I wanna get this phone with an upgrade. But idk which plan I should take? I barely make calls and mostly text and use data/wifi. So what would be the cheapest/best for me? Can anyone help? Wow….do some research and make your own decision. Just took advantage of this deal. Thanks for posting! They also had a trade in program and they gave me $55 for my broken 3G Slide, so I ended up paying $50 with tax for the Sensation! Hi, which number did u call for the trade in – or did u go to a store? Thanks ! How did you do that ChinaMike? At at a Target store, or online? Keep trying Jessica, or you can try calling Target mobile store directly, as they do allow over the phone orders. I ordered this. Then an hour later I got an email telling me my order was cancelled because I couldn’t get the phone at the discount unless my contract was up. Huge disappointment. I think Target should have told me that up front. “With new or upgraded 2 year agreement”. Shouldn’t that mean it would be $100 for an upgrade. I guess not. As always, upgrade pricing is available to contracts that had fulfilled the 22 months of service for 2 year contracts. surprise web: == www jordanforworld com====very good web,believe you will love it. FREE SHIPPING,accept pyapal discount including evisu jeans,watches shirts,bags,hat and the decorations and so ontrust me!Opportunity knocks but once?????.’,”’,,’,.”,,’,”,.?????”o’,”’,,’,.”.”,,’,.?????? ”,,’,.’,”’,,’,.”?????????????????? How come I cant locate a target store that carries tmobile in Florida? Just upgraded yesterday. Literally seconds after I signed I saw this post… The reps at store told me that deal was only for new customers. Which looks to be untrue. Guess I’ll try to get a price match. I’m loving my new HTC Sensation. Great upgrade from my mt4g. And for only $100!! I’m using it to type this paragraph at this very moment. Traded in my old BlackBerry 8320 for $25 and mytouch 3g for $40. Only paid $41 for Sensation. Awesome phone. Yay me!!!! For those that upgraded, did they transfer your number to the new sim, or did you just use the old sim. The paperwork that came in mine is contradictory. One sheet states that the service will be transferred to the new sim and the old one will be terminated. But the receipt says to not put the new sim into the phone.